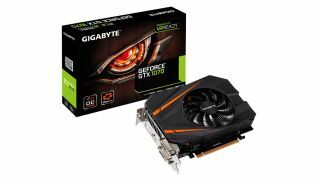 Usually, if you want to build a compact gaming PC, you'll need to sacrifice something in the way of power for that portability – but not if Gigabyte has anything to do with it, as the company's latest Nvidia graphics card offering is a GTX 1070 which is small enough to fit in a tiny case. The GeForce GTX 1070 Mini ITX OC is, as the name suggests, designed to fit in a Mini-ITX case being only 17cm long. But despite its diminutive size, the card is still a fully-fledged 1070, and indeed offers one-click 'super overclocking', with a base clock of 1531MHz and boost to 1721MHz (rising to 1556MHz/1746MHz in OC mode). You get 8GB of GDDR5 video memory on board, and because this is a compact card with a lot of power crammed in, there's a custom-built cooler featuring a 90mm fan (with a "unique blade design" that offers a claimed 23% better airflow compared to a traditional fan) and three copper heat pipes to help guard against any potential overheating worries. The card comes with a three-year warranty, and as CNET spotted, it's on pre-order with Overclockers UK at £430 (around $560, AU$750) currently. On an overall level, Nvidia's GTX 1070 is a very capable card and as we noted in our review, it puts in a strong performance driving 1440p resolution gaming.